This is an activity about planning a planetary mission. 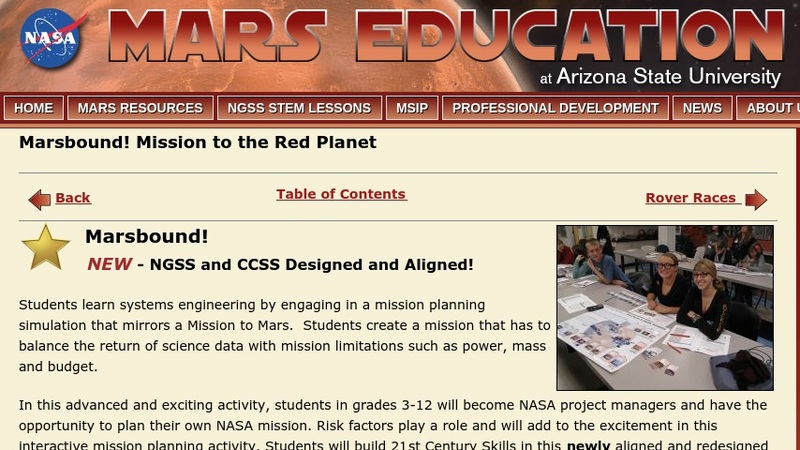 Learners will play a card game to design a mission to Mars. This game will allow them to experience the fundamentals of the engineering design process as they use collaboration and problem-solving skills to develop a mission that meets constraints (budget, mass, power) and criteria (significant science return). This activity can introduce many activities in technology education, including robotics and rocketry. The lesson models scientific inquiry using the 5E instructional model and includes teacher notes, vocabulary, student journal and reading.